Poetics: Animal Symbolism or Antics? Good morning/afternoon/evening, everyone! I am delighted (and somewhat overawed) to be your host here today. It’s my very first time on this side of the bar but I’ve been dropping in at the dVerse Poets Pub whenever I could over the past 18 months. I’ve learnt so much from your prompts, poetics, poems and ‘pinions (see what I did there? Couldn’t find a fourth ‘p’ though for comments). 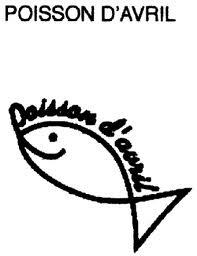 Today is the 1st of April, April Fools Day, which here in France means only one thing: Poisson d’avril. It is celebrated with a cut-out of a fish to be stuck on the unsuspecting victim’s back. And this got me thinking about all the other animals we like to use in our art, stories and poetry. From the very earliest cave paintings, animals have played such an important part in our development (and differentiation) as humans. Sometimes we perceive animals as eminently positive: symbols of strength or grandeur, compassion or mercy, godliness or spirituality. The lion Aslan in the Narnia stories, the Lamb in the poetry of William Blake, Anubis the god with the head of a jackal in Ancient Egypt guiding the recently dead are a few examples which come to mind. Quite often, however, the animals represent something more malevolent and threatening. They don’t even need to be hairy spiders, slithering snakes or black cats to fill us with unease. There is a menace there, the sense of the ‘other’, of something far wilder and freer than we could ever be, perhaps. William Blake’s famous poem ‘The Tyger’ is a companion piece to his Lamb poem and in fact expresses that dawning understanding that ‘He who made the Lamb made Thee’. But just listen to that wonderful sense of feline prowling and menace which he achieves through alliteration, repeated interrogation, trochaic tetrameter and imperfect rhyme in the first stanza. The atmosphere of the poem is perfectly captured in the painting by Henri (Le Douanier) Rousseau. the charmed woods to return. But there are other, more light-hearted aspects to animals. Even great sombre poets like T. S. Eliot succumbed to their charm. In his delightful volume ‘Old Possum’s Book of Practical Cats’, he demonstrates perfect understanding of cats just being themselves, with no heavy symbolism at all. Have fun reading all the entries – I know I will! make their way into the pub this evening…. Looks like it will be quite a menagerie! What fun! Lions, Tigers and Bears-oh, my! My pleasure to be here! Happy April Fools, hope you weren’t fooled (except by your daughter’s delayed plane), and Happy National Poetry month to all! Hello Marina Sofia – Love the prompt – For April Poetry Month, I’ve decided to shoot a picture a day and write a short senryu or American sentence for it. I’m posting these to my photo blog which All My Art For Me and is http://meghrc.wordpress.com and today feature animal art around my house. Have a happy fish day. Love knowing that. Thanks. ah that is a cool plan gay….i like your idea…. My previous reply did not register, but just wanted to say what a cool idea to celebrate National Poetry Month. And I don’t care what national it is – poetry deserves to be celebrate, and not just one month! The more animals the merrier! you can always double dip at poetics or at MTB…its only OLN we limit it on KB…enjoyed your dog poems…smiles. i will be by after school….can’t access it from school due to the filter…. Certainly quite a few more pictures than I expected! Are you sure all of them were necessary? But, like you, I think wolves are fascinating – scary, but fascinating! great prompt Marina!!! haven’t started on mine yet.. still deciding on what animal I want to use as inspiration… smiles. So many to choose from – looking forward to it! Love this topic. Inspired me to actually write. Been mostly withdrawn and quiet. Thank you! Oh, so pleased to hear that – hope things start looking up for you. What a lovely prompt. For NaPoWriMo (first day today), my prompt was for a prey animal, sort of. I am going to go with it and post the same poem here. I love it when something synergistic happens. That’s a lovely coincidence (or is it?). Look forward to reading your poem. Lovely post Marina. 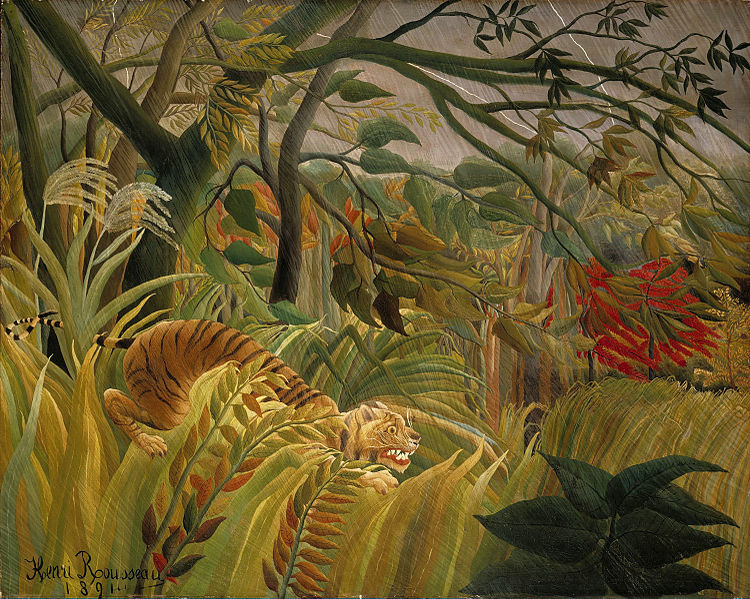 I like the Rousseau/Blake combination. Thanks – the two are inextricably linked in my mind. Thank you for the prompt, Marina! I had fun writing it. Interesting prompt, Marina Sofia. I took a kind of light-hearted twist with my poem, but it has a deeper meaning if one thinks about it. LOL. Welcome to the bar. You will enjoy hosting, I am sure. There always is a deeper meaning, isn’t there? Thanks for the welcome, I really, really love my time here at the Pub (in front of and behind the bar). I hope I didn’t overstep the mark with my ‘scary claws ‘ poem as a second helping this evening. The poem isn’t up to much, but the claws picture made me shiver when I took it. This was such a great prompt. Can we have it again soon ? So many completely different takes to enjoy, that I am missing my favourite TV programme. Great idea to have two different takes on a topic – and absolutely fine for the Poetics prompt, as Brian assures us. Animals are indeed full of symbolism (or else we’ve endowed them with that). I love that interplay between good and evil. Welcome aboard, Marina Sofia. I enjoyed your prompt and look forward to everything you will share with us. I didn’t realize you lived in France! A beautiful country in which, a long time ago, I left some of my youth (3 years). I will be in soon. Did you really spend 3 years in France? I’m coming up to the end of my 3rd year now – and probably will stay for another 3. Look forward to reading your contribution, Victoria, always love your thoughtful work. Oui. 2 ans a La Bretagne, 1 au Jura. When you do leave, try to keep up with your French. When I lived there, I thought and dreamed in French. Now I struggle to speak and find the word I want. Of course that happens in English too. Ha! I just added another poem–real short one. Bless you, Polly, you were the one who introduced me to dVerse Poets! Look forward to seeing more of you here soon. I had fun with this one, too, Marina Sofia. (By the way, I think your name is sooo beautiful!). I’m spreading my wings, er feathers for this one. Happy NaPoWriMo! Thanks for the prompt start! Children really relate to the rhythm and musicality of Blake – I remember loving (and not understanding) his poems as a child. Thank you for your very warm welcome, Imelda! Sorry, guys, had to go to bed (without a cat purring, this time) – night time over here. Am back now and will be reading and commenting on your poems! Sorry to post so late and respond with comments even later tomorrow, but your prompt motivated me Marina. Thanks for hosting. Never too late – I usually am the last at the feast, so I’m not one to criticise! A great post and prompt. I simply love Blake’s Tyger and I have the book of cat poems:) Tigerbrite is my power animal, I met him during a past life regression and now he is always with me. Interesting about the April fish, more fun than the fool I think. Now I will try and write something before the page closes. Please do – especially since you have such a connection with tigers! They are magnificent creatures, aren’t they? CATS! Somewhere I have a copy of that book. And Tyger! Two of my favorite poets and their works with animals. Loving this, and I’m SO happy I can join in. Two of my favourites as well… So glad you approve – I envy your life on the farm with all those animals (although I know what hard work it is). It is, and yet it is an amazing thing to be around animals. They can teach us so much about life and ourselves if we let them. ooops…forgot to link! !…love the prompt especially as we had done a similar one recently in the Writers Workshop at The Gateway Warrington…a super gang of fiesty women who meet and write once a week. This one is for fun…hope you enjoy it!! Hi Marina, animals are truly a subject I adore and have written on before. If I cannot squeeze a poem out today (HA! Bite my tongue) then I shall link an older written face. I am a day late… and currently a poem short… and we shall see! Ah.. I made this night round.. quite a nice menagery we have here.. I had no idea on how to comment on Adam Moursy’s piece on ants.. but it reminds me to put anything sugary under tight lids for a while… spring is here. Yes, I couldn’t leave a comment there either – such a shame, as it made me feel creepy-crawly all over! I tweeted it though.